Hi everyone! it's stash reporting time. I missed last week, cuz I was still sick. I am sooooo done with that. I have finished several things. but they are all for the Wicked Blop hop coming up. So no pictures of those. So in about 1 week I will have a lot to report. Yeah! that makes me happy! Broomstick Hollow: Cyndi and I are working on this together. I am cutting up my oranges for it. Oranges and blacks are all cut. I can start sewing! all houses and pinwheels are done. now for the stars! stars are done! Toni and I are going to get together to make LOTS of purple and green half sq triangles! Scrappity do dah: in Thornberries we have started a new swap. you can find the pattern HERE. there are 4 of us swapping. all my blocks are done! Scrappy Cheddar: But mine is PINK!!! I follow Tattered Garden. I fell in love with this quilt. I look where I keep all my scrappy precut squares and mercy, the 2" drawer is over flowing. So I am using this as a leader ender project! I have lots of 2 patches, 6 patches and 14 patches done. I have probably 10 blocks done. I feel good how the project is going..... 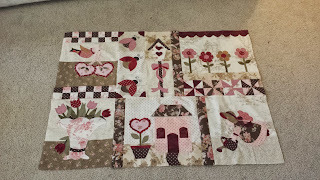 I can't believe this, but I need to cut more 2" squares. oh my! 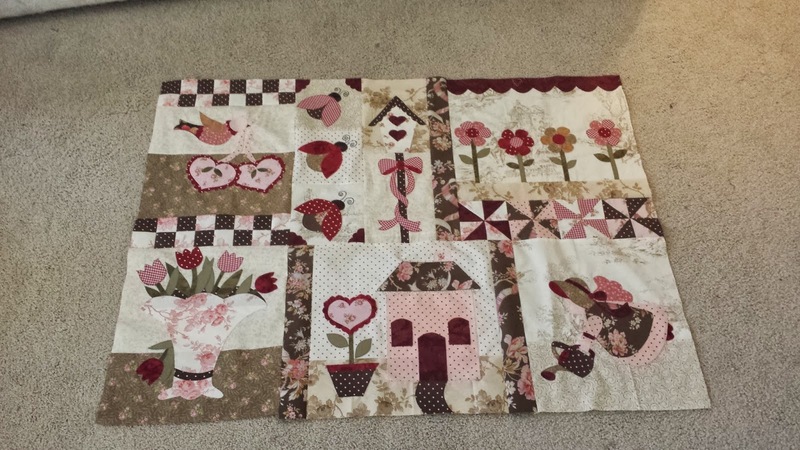 here is my blessings quilt so far!